With A++ and A+++ energy ratings, Siemens built-in and freestanding cooling appliances and their advanced technology makes them incredibly energy efficient. Siemens offer a wide range of stunning freestanding fridge freezers including American style side by side models and a superb range of integrated models which fit seamlessly into your kitchen design offering innovative features such as VitaFresh. With other options, available like ice and water, non-ice and water, plumbed and non-plumbed, homebar and frost free, you can find your perfect fridge or fridge freezer with Siemens. This handy integrated fridge fits seamlessly in your kitchen as it is installed in a housing unit and with a furniture door. Offering a generous 125 litres of capacity it's ideal for popping your fresh food in, and with easy to use deep door racks you can fit in a brilliant array of items. We love the handy ice box, ideal for keeping a few essential frozen treats close to hand! With an A++ energy rating you can be assured running costs will be nice and low as well. With plenty of room and offering hassle free use, the brilliant KG39NXI35 from Siemens is perfect for the busy family kitchen. With the frost free freezer you can ensure all your frozen favourites are kept perfectly stored, without the inconvenience of having to defrost the interior, and as the KG39NXI35 uses Multi Airflow cooling an even temperature is maintained throughout. Perfect for creamy ice cream in the freezer and juicy berries in the fridge. To keep your fruit and vegetables even more fresh, the Hyper Fresh drawers control the humidity using sliders for optimum conditions; no more soft peppers or soggy lettuce! And your meat and fish is catered for as well, thanks to the 0°C box, which keeps the temperature inside the container very low so you can keep items inside for up to twice as long. 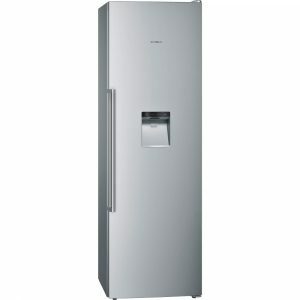 This Siemens freestanding fridge freezer looks streamlined and contemporary in a stainless steel finish. It offers a generous 288 litres of storage space, which is more than enough capacity for the weekly supermarket shop. 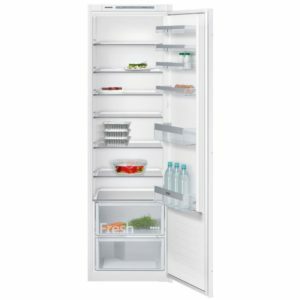 Your shopping will be well looked after in this fridge freezer, with a humidity controlled salad crisper and low frost, which prevents the build up of icy deposits and maintains an even temperature. A Hyper Fresh drawer allows fruit and vegetables to stay fresher for longer thanks to the clever air circulation system. A bottle rack is a nice feature in the fridge and it is all highlighted by the cool LED lighting. A SuperFreeze function ensures new food added is frozen quickly to help retain flavour and texture. With a more than impressive A++ energy rating, this fridge freezer would be a super stylish and energy efficient addition to your kitchen. Designed to be installed in a tall housing unit, the KI81RVS30G is perfect if you want to maintain a streamlined kitchen. Offering great cooling for all your food, this integrated fridge uses Siemens Fresh Sense technology to actively regulate the temperature so the interior is cooled evenly. The handy Super Cool function is ideal when you need to rapidly lower the temperature, such as when loading in the weekly shop! With an A++ energy rating and a noise level of 37dB it's ideal for a family kitchen. Superb cooling, good looks and filtered water at the press of a button, we would all love one of these fridges in our kitchen! The KS36WBI3P connects to your mains water meaning you can dispense filtered water with ease, ideal for when you need rapid refreshment, and using clever Fresh Sense technology, it monitors and regulates the interior temperature so you know all your food is taken care of. Using the HyperFreshPlus salad box you can control the humidity of the container ensuring that your fruit and veg are stored in ideal conditions for great freshness. All in the roomy 346 litre capacity and with an A++ energy rating for that extra peace of mind. 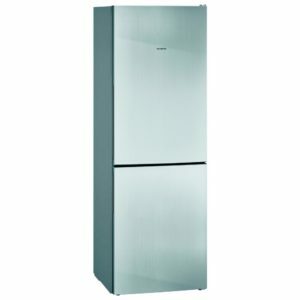 What's not to like about this American style fridge freezer from Siemens? Open up the stainless steel doors to reveal a whopping 526 litres of space comprising of safety glass shelves, FreshProtect compartments and humidity controlled salad drawers. The Hyper Fresh plus box has adjustable humidity options to keep your fruit and veg fresher for up to two times longer. 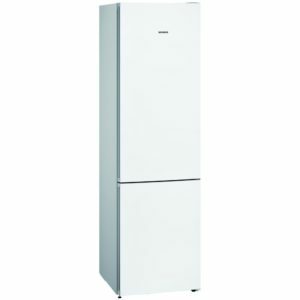 Chilled water and ice is just a touch of a button away, thanks to the water dispenser and automatic ice maker and if that's not enough, the KA92DAI20G is completely frost free and has an A+ energy rating, which will keep your energy bills nice and low. Featuring Siemens Home Connect function enables you to connect to your appliance with your smart device from anywhere with a suitable WLAN connection. Making life just that little bit easier! With plenty of flexible storage space, the KI86NVF30G offers brilliant cooling and freezing performance, while discretely installed behind furniture doors for a perfectly streamlined kitchen. The VarioShelf and easy access shelves mean that it's incredibly simple to get all your food in and out and with the Big Box in the freezer, you can even fit in large items like the Sunday roast! Fresh Sense technology keeps the interior cool as it monitors the temperature and for that little extra peace of mind the frost free freezer spells the end of painstaking manual defrosts! 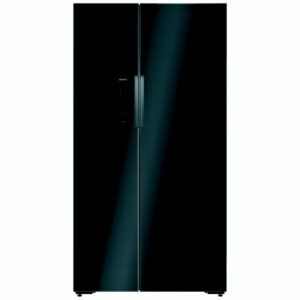 Bursting with features, the fantastic KG39NVW35G from Siemens will let you keep your food incredibly fresh while the handy frost free freezer makes sure there's no more manual defrosting or ice scraping. With two 0°C boxes in the fridge you can be assured that meat and fish will be kept fresh for up to twice as long as the temperature is kept very low, and the Hyper Fresh salad boxes allow fine control of the humidity using sliders for perfectly stored salads! You can also be sure that even the most pungent foods won't cause a stink as the Air Fresh filter helps eliminate odours. Boasting an energy rating of A++ running costs will be kept nice and low as well. Stunning design and excellent performance really ensure that the KA92NLB35G from Siemens stands out. Boasting 577 litres of capacity behind black glass doors, it is brilliant to behold, offering incredible flexibility as well thanks to Vario Zones with adjustable storage. The Hyper Fresh plus box ensures fruit and vegetables stay fresh for up to twice as long. Adjust the humidity controls for optimum food temperatures. It is frost free, so there's no more manual defrosting, and the twin evaporators ensure that there's no transfer of humidity between fridge and freezer. We love the Ice Twister, dispensing ice cubes easily, perfect for refreshing drinks on those hot summer days! 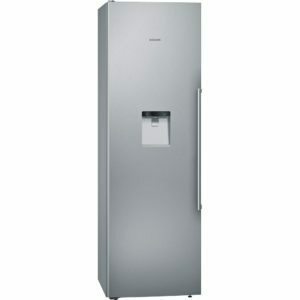 This Siemens freestanding freezer in stainless steel with its long sleek steel handle looks amazing. 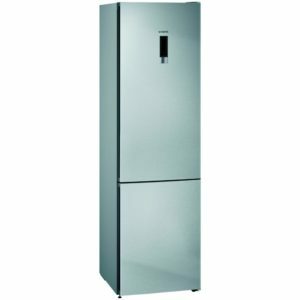 It features an LED touch control panel for ease of operation and a fabulous ice dispenser offering you cubed or crushed ice. Inside this lovely freezer you are getting 210 litres of space so you'll never have to worry about running out of freezer space again. Activate the Super Freeze button before you go food shopping and it automatically reduces the freezer temperature in readiness for your shopping. Siemens have added No Frost technology which removes humidity from the air preventing frost and icy build ups, meaning you will never have to defrost the freezer again. The flexible drawers and shelves can be swapped around to offer versatile storage options and all of this is topped off with bright LED lighting. With an A+ energy rating this freezer just gets better and better! 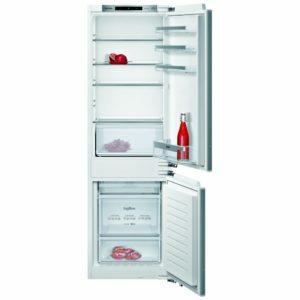 Great 70/30 refrigeration from Siemens! 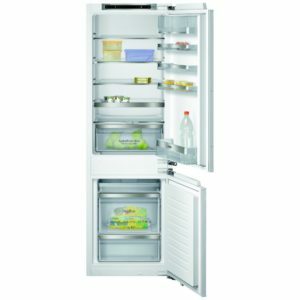 This integrated fridge freezer is ideal for households who eat more fresh food than frozen or those who already have additional freezing capacity, like a chest freezer. Boasting an impressive total capacity of 268 litres and a Hyper Fresh box with adjustable humidity, your fruit and vegetables will keep their freshness for longer. Designed to seamlessly integrate into a fitted kitchen the KI86SAF30G has a desirable energy rating of A++ and teamed with its low noise level of 35dB you'll barely know it's there. With fantastic style thanks to the black stainless steel doors, the KG39NXB35G certainly makes an impact in your kitchen. 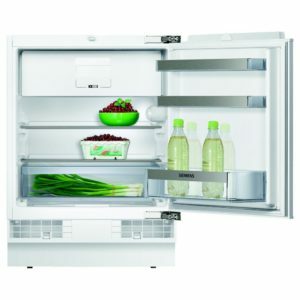 Not just attractive but with plenty of features to keep your food fresh and use simple. There's plenty of space with 366 litres and adaptable Vario Zone shelves. Love salad but fed up of soggy lettuce? Check out the Hyper Fresh box, which uses humidity sliders to control the climate for storage, and with 0°C boxes ideal for meat and fish, you can keep even the most juicy steak up to twice as long. The frost free freezer means you have no more manual defrosting, which gives you that little bit of time back for yourself. With an A++ energy rating as well you will be able to keep the running costs low. Smeg have earned themselves notoriety all over the world for their classic design and high performance. If you like any of these Smeg products, check out our other Smeg appliances. 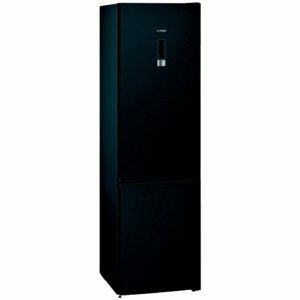 If you want to look at more refrigeration appliances, click here. 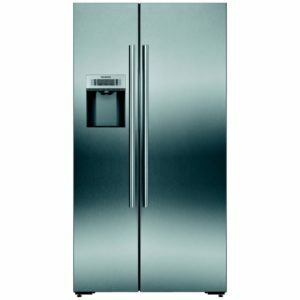 We have outstanding lines of American-Style fridge freezers as well as fridges, freezers, fridge freezers and wine coolers.